The Content Strategy tool is a part of the marketing platform. But, while the tool itself is pretty cool, the best thing about it is what it represents. With the launch of this tool, HubSpot is making a major shift in how they talk about using content for lead generation. Until now, the inbound methodology popularized by HubSpot has been pretty much the same. You started with research to figure out what kind of content your prospective customers were looking for, and what keywords they used to search for those things. You would typically end up with a long list of keywords, many being variations of the same concept. Then, you would write a blog post optimized for each keyword on that list. If you did this well, you’d have a decent chance of getting those blogs posts in front of potential customers when they used search engines like Google to seek out information. Once someone found your blog article and visited that page on your website, they would find opportunities to download what we call “premium content.” These were usually ebooks, guides, whitepapers, etc. that would go into greater detail about a topic relevant to the blog article. If someone wanted this premium content, they could get it for free by providing some information in a form. We, as marketers, could then use that information to nurture them towards a purchase. Okay, okay, that might be a little dramatic. But keywords are way less important than they used to be. That’s because search engines like Google are crazy smart these days, and they’re only getting smarter. They now have the power to understand language almost like we understand language. They no longer just look at the exact words typed in to a search bar and serve webpages that use those exact words. Now, they’re able to actually understand what the searcher is really looking for and serve webpages that contain that content. Because of this power, the way we search has also changed. 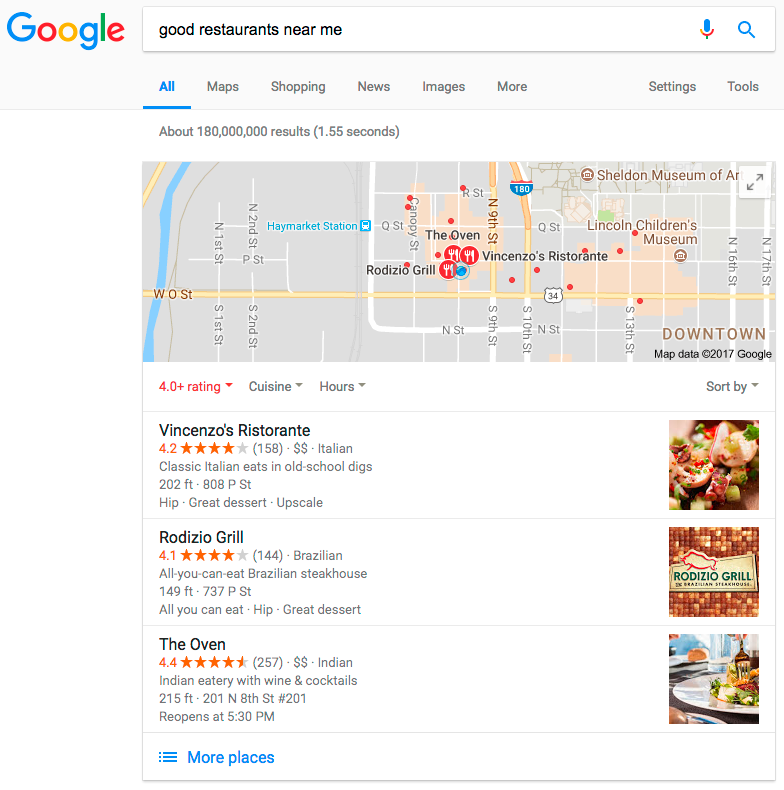 When looking for a good restaurant that served dinner in our city in 2008, our search might’ve looked something like this: “restaurants, dinner, 5-star yelp, Lincoln Nebraska.” Now, we simply type in “good restaurants near me.” These natural language searches are becoming even more popular as voice-based searching spreads with tools like Siri and Alexa. Now that search engines are smart enough to know that searches like “search engine optimization tips” and “how to rank high in search engines” are basically the same thing, it’s much less important that you write a blog article optimized for every single relevant keyword you can think of. Today, you should be focused on writing about topics rather than keywords. This means that the days of writing a ton of blog posts with just slight differences between them are over. Instead, you can create a smaller group of content that thoroughly covers the topic you want to “own” on the web. This concept really isn’t that new. Top search engine optimizers have been talking about this for a couple of years now. You may have heard it called the hub and spoke method, skyscraper content, content clusters, pillar pages, or a number of other names. But, until now, there was a fundamental problem when you tried to incorporate this new strategy into your inbound marketing. That’s because the kind of content that works really well for this new era of search engines is detailed, long-form content, with several related blog posts that link back to it. In other words, it requires you take the same content that HubSpot used to tell us to put in a PDF and hide behind a form, and make it openly available on a webpage. It’s that premium content like guides, ebooks, whitepapers, etc. that searchers want to find, but search engines can’t deliver it if it’s in a PDF. HubSpot realized this issue and went to work on figuring out how their recommended tactics needed to change. Out of that work, the Content Strategy Tool was born. But before we dive into that tool, let’s talk about the new way to handle that long-form content without sacrificing your ability to use it to generate leads. So what happens when we take all the content we were using to generate leads and just make it openly available? How do we get new leads and continue to learn more about them as they progress through the buyer’s journey? Well, there are two ways to do it, and we recommend doing both. First, HubSpot found in its research with several of its partner agencies that people will still download a PDF of long-form content (and fill out a form for it), even if it’s openly available on a webpage. This is because people will often want an offline copy they can share or come back to later. With that said, you would be correct in assuming that your conversion rates will go down. This is why we recommend shifting what you consider to be your premium content. Thorough informational content is certainly valuable, but is that really what your audience wants most? We believe that in this world of information overload and fast-paced lifestyles, short tactical content and tools are more valuable than the guides and ebooks we used to rely on for lead generation. Think about ways you can take your long-form content and make it more consumable. Can you offer it in a one-page top 10 list, or offer to send out the same information in an “email course” that breaks the content into short segments over several emails? Or, what is a relevant tactical tool that you can offer? Maybe a checklist, template, quiz, or online calculator? Your readers will be more than happy to provide their information in exchange for things that save them time or help them take action with your information. So now that you know you don’t have to give up your leads to implement this new strategy, how does the new Content Strategy tool help? 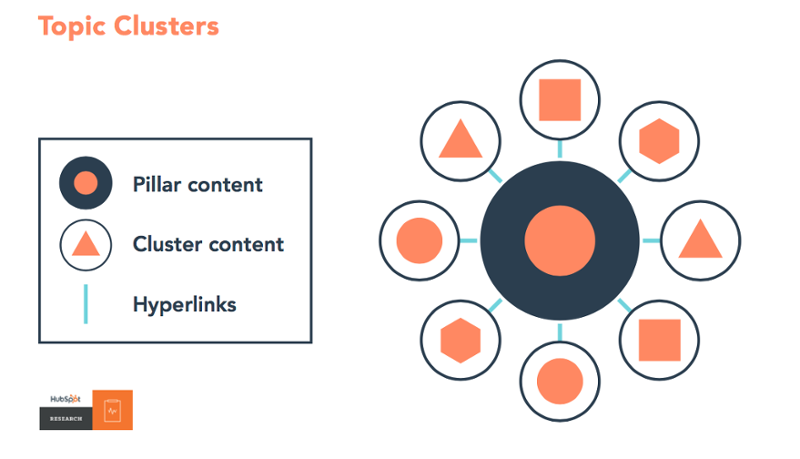 The Content Strategy tool was designed to easily organize your content into what HubSpot calls topic clusters, all linked to that detailed long-form content it refers to as pillar pages. As the image below shows, the tool really helps you visualize this concept. Another great feature of the Content Strategy tool is that it will actually help you choose content for your pillar pages and subtopics (the blog posts that link back to your pillar page). However, this part of the tool is super new. It only really works for sites that already have a lot of content, and even then it’s still not perfect yet. You should choose topics that you really want to “own” on the internet. They should be something that your audience is interested in searching for AND something that’s strongly related to the core value your products or services provide. For these topics, you don’t have to worry as much about how competitive the first page of Google is, so don’t choose a long-tail keyword. Choose something with medium to medium-high competition (probably about two-three words long) that generates a good amount of search traffic. If you already run an active blog, a good place to start is by looking at your most common blog categories or tags. You should also look at the content that’s generating the most traffic to see if it can be modified into a pillar page and give you a head start. Another way to begin is by taking a look at the common questions your customers ask, and evaluating whether one of them can be turned into a topic you want to be the authority for. Give away the detailed guides and use the shorter, more tactical tools and information for lead generation. Think in terms of topics rather than keywords. 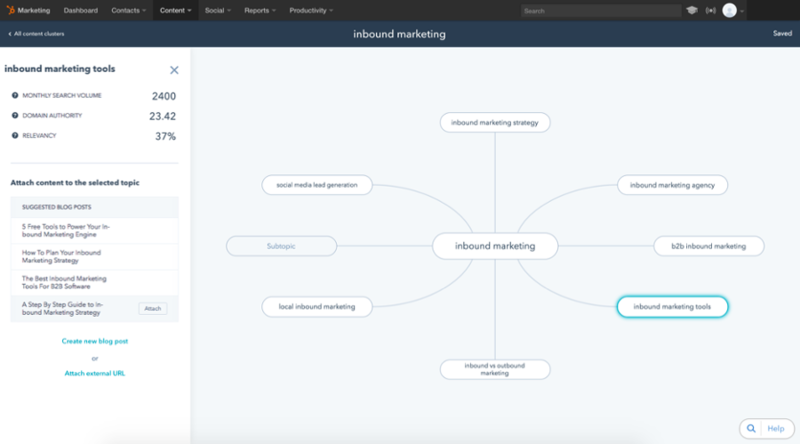 Leverage tools like HubSpot’s Content Strategy tool to help you reorganize and structure your content. These changes will probably take some time for your organization to implement. But the sooner you get started, the sooner you can take advantage of the trend and truly own a valuable section of the web – establishing your company as a thought leader and turning your content marketing into a revenue generating machine.